RE: Etymology Maps: How am "I" in Europe? Here in Brazil the most used word for pineapple is "abacaxi". We also have the word "ananás" but it's not as widespread as "abacaxi". Ananás comes from old tupi, the indigenous language which was for the first first two centuries after the portuguese invasion, the mother tong language for indigenous, whites, blacks. It was the lingua franca for europeans around here. Ananás, from old tupi, "naná". Abacaxi, as we use here, comes from the same old tupi language, from "ybá ka'ti", smelly fruit. It's funny. 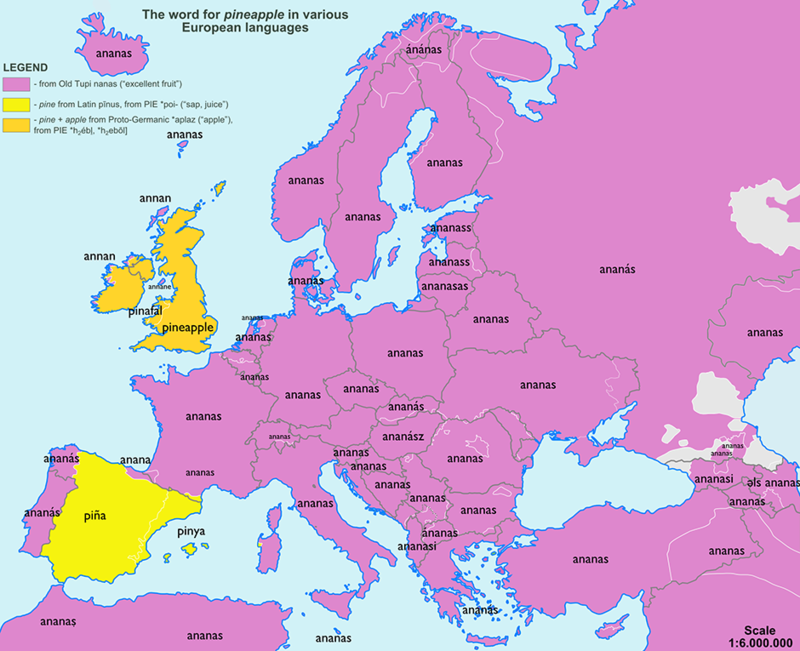 The word ananas has widespread its usage around the whole of Europe and Asia, while here, where this word (and the fruit) has come from, we use a totally different word ("abacaxi").